Now, I am not a baker by any means, but making the rainbow cake for my daughter's birthday was way easier than I thought it would be. Seriously. I was pretty nervous about it, but as you can see, it turned out pretty well. 1. Mix up your white cake batter as usual. 2. Separate the now-mixed batter into six bowls (or however many different colors you want). 4. 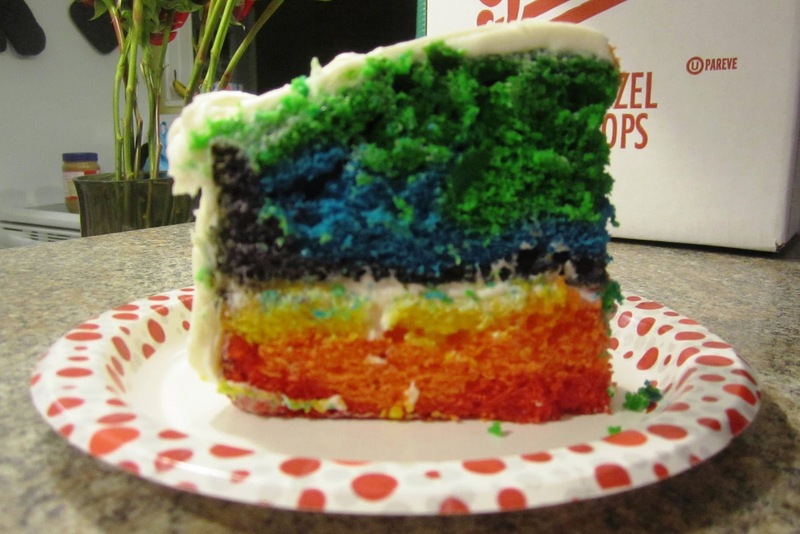 Pour each bowl of colored batter into the cake pan one at a time, attempting to making even layers of each. Interestingly (and this is what I was worried about), the colors don't mix together. I had a bit of a difficult time getting the layers even, but even so I think it turned out great. Perfect as far as I was concerned. And seriously, ladies & gentlemen, it really is that easy. I still can't believe it worked. Already planning out what to practice with next in the kitchen. Ha!